Deferred Action for Childhood Arrivals (DACA) was created by the federal government in 2012 to allow certain individuals who came to the United States as children and meet specific guidelines to request consideration to live and work in the United States for a period of two years. 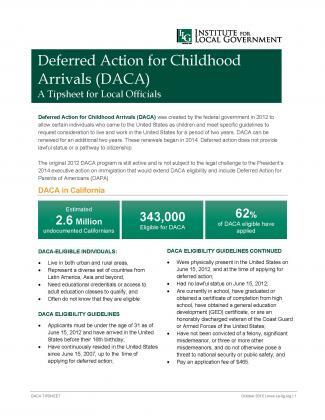 This tipsheet provides an overview of DACA. 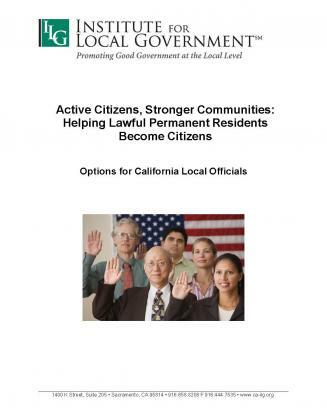 This resource explains the process and barriers to citizenship and discusses how local officials can support the naturalization process in a way that creates better community engagement. California is home to about 2.5 million “lawful permanent residents” who are eligible to become citizens. 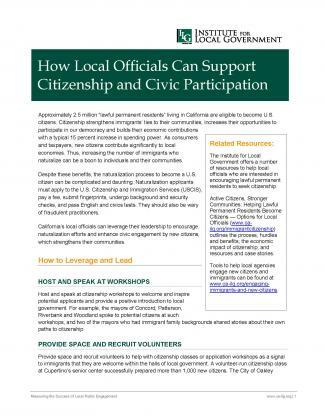 ILG offered a webinar in October 2013 to help local officials build stronger and more cohesive communities by encouraging lawful permanent residents to become citizens. Watch the webinar recording on the right to learn how citizenship can strengthen the ties immigrants have to their communities.